We had a question come in from Graham Buttle that we felt was best answered as a post on the site. Graham asks…. 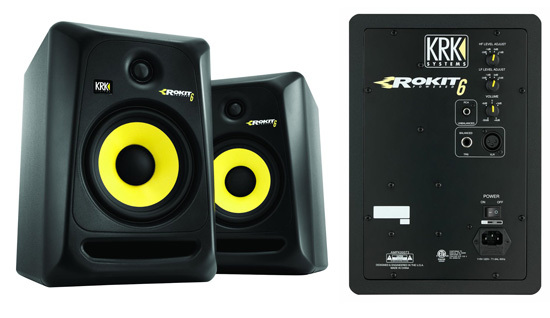 I recently bought some KRK Rokit RP6 G3 monitors to use with my Avid MBox Pro 3rd Gen. Previously I was using a hifi amp and speakers with no issues at all. With the new KRK’s I have a crackling digital static sound coming from both monitors when using balanced cables (TRS to XLR). With unbalanced cables you get general pink noise! The noise is equal from both channels, the Mbox interface level control makes no difference to the level of noise and is the same on all 6 outputs. This is with the KRK’s at default setting +6db gain. To get rid of the noise you need to turn the gain down to around +3db and whack up the level on the MBox. Running Mac Book Pro on battery makes no difference. I found this on the DUC from Avid but states only an issue with Focal CMS 50 monitors. My headphone output is clean. The speakers are brand new and they work perfectly OK, plugging an iPod directly into them with no noise. I’m using Pro Tools 11.0.2 on Mac Book Pro 2.9 GHz Intel Core i7 8GB RAM OSX 10.8.5 and the MBox Pro is on the latest driver version 1.2.2. According to the DUC and various other sites many other people have the same issue with MBox Pro’s and various speaker combinations and there does not appear to be an answer from Avid? These links below on the DUC are the same as my problem but I am using KRK RP6 Gen 3 monitors. The MBox Pro is under warranty and DV247 can get it sent back for repair but I doubt if they would find anything wrong with it personally? I’m disappointed as I only bought an Avid interface to be ‘fully supported’ etc etc. This sounds like a gain staging issue. When settings up any signal path it is crucial for the best performance to make sure that the signal level at each point through the chain is at the optimum. With speakers this is what I always do, whether it is studio monitors or a PA rig. If I had a dollar for every time I have come to a PA system and found the amplifier gain controls up at maximum and then I would be a very wealthy man. So back to Graham’s problem. You have touched on the solution. in your question. The solution is to turn the amps driving the speakers, whether it is a separate amp or they are active speakers where the amp is mounted in the speaker cabinet, right down to minimum. Set the levels of the system so that they are running at optimum. In this case Graham, I would run the output of the Mbox to maximum. Now turn up the gain controls on the amplifier driving the speakers until the volume is comfortable. You should then have no hiss and noise on the speakers. If you do then it is more likely that there is a fault with the Mbox, although if you can restore the hifi amp and speakers and all is OK that would point to the audio leads. The key thing with fault finding is to change one thing at a time, unltil the problem goes away and then restore it to make sure it wasn’t a fluke.